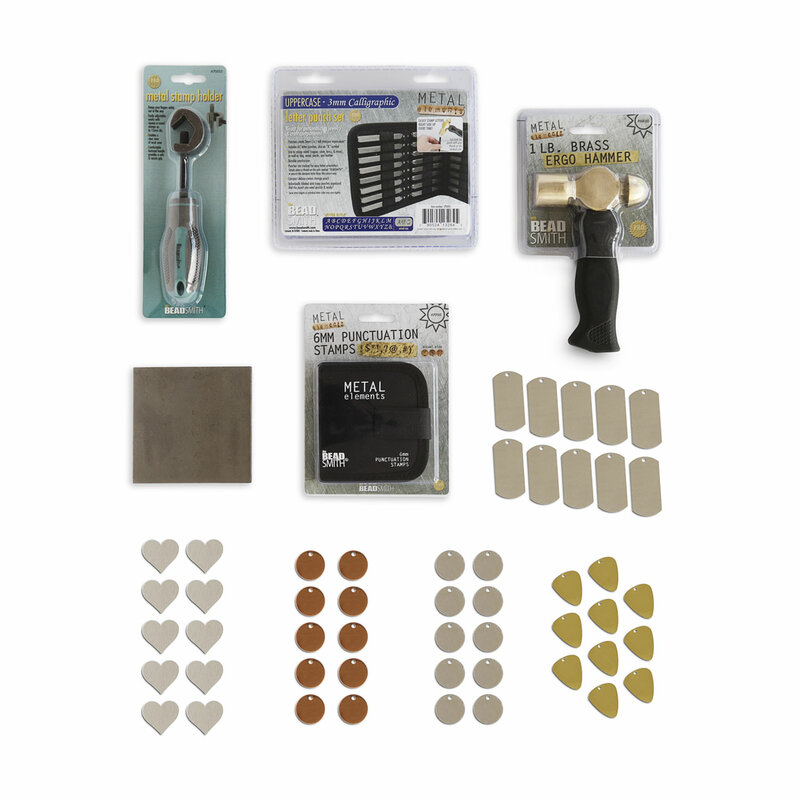 RMP Metal Stamping Starter Kits include all the essentials for your metal stamping hobby. They're great for personalising jewellery or any craft idea! This kit includes a punch set consisting of alphabet letters A-Z as well as the "&" symbol and comes in a canvas storage pouch. The alphabet characters are 3mm (1/8 inch) in height. Also included in the RMP Metal Stamping Kit is a Punctuation Punch Set consisting of $ ! ? . () " " , @ # symbols and comes in its own canvas storage pouch. The punctuation characters are 6mm and work well with the alphabet stamp set. The 1 Lb. Brass Ergo Hammer has flat and round faces and a weighted head for consistent impressions. The Universal Metal Stamp Holder keeps your fingers out of the way and provides a clear view of your most tedious projects. It works with stamps up to 15mm. The RMP Steel Bench Block gives you a hard surface to help further provide even, consistent impressions for your projects. RMP has included a sample pack of our most popular metals and shapes. 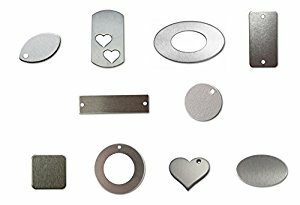 Included in the stamping blank sample pack is 10 pieces each of our 1" Copper Round With 1 Hole Blank, 1" x 1.188" Brass Guitar Pick With 1 Hole Blank, 1" Aluminum Round With 1 Hole Blank, 1" x 2" Aluminum Dog Tag With 1 Hole Blank, and 1.25" Aluminum Heart. That's a total of 50 sample stamping blanks. With this RMP Metal Stamping Starter Kit you will be ready to create beautiful pieces of jewellery and/or art work.